Researchers have reached a critical milestone in solar cell fabrication, helping pave the way for solar energy to directly compete with electricity generated by conventional energy sources. Led by the U.S. Department of Energy's National Renewable Energy Laboratory and in collaboration with Washington State University and the University of Tennessee, the researchers improved the maximum voltage available from a cadmium telluride (CdTe) solar cell, overcoming a practical limit that has been pursued for six decades and is key to improving its efficiency. The work is published in the Feb. 29 issue of Nature Energy. Silicon solar cells currently represent 90% of the solar cell market, but it will be difficult to significantly reduce their manufacturing costs. CdTe solar cells offer a low-cost alternative. They have the lowest carbon footprint of any other solar technology and perform better than silicon in real world conditions, including in hot, humid weather and under low light. However, until recently, CdTe cells haven't been as efficient as silicon-based cells. One key area where CdTe has underperformed was in the maximum voltage available from the solar cell, called open-circuit voltage. Limited by the quality of CdTe materials, researchers for the past 60 years were not able to get more than 900 millivolts out of the material, which was considered its practical limit. The research team improved cell voltage by shifting away from a standard processing step using cadmium chloride. Instead, they placed a small number of phosphorus atoms on tellurium lattice sites and then carefully formed ideal interfaces between materials with different atomic spacing to complete the solar cell. This approach improved the CdTe conductivity and carrier lifetime each by orders of magnitude, thereby enabling the fabrication of CdTe solar cells with an open-circuit voltage breaking the 1-volt barrier for the first time. The innovation establishes new research paths for solar cells to become more efficient and provide electricity at lower cost than fossil fuels. "It's a significant milestone. 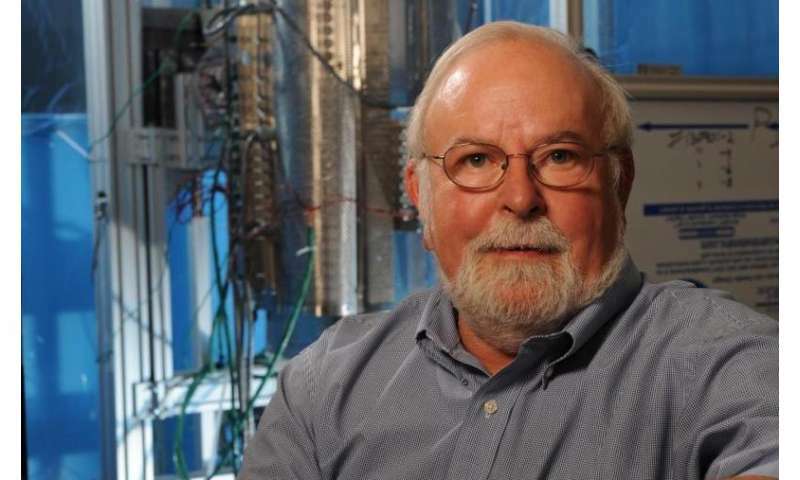 It's been below 900 millivolts for decades," said Kelvin Lynn, Regents professor in WSU's School of Mechanical and Materials Engineering and Department of Physics, who led WSU's effort. The NREL researchers treated the crystals, built and characterized the solar cells, while WSU researchers, including Santosh Swain and Tursun Ablekim, developed -the crystal material used in the cells. The WSU researchers grow their crystals in a technique called melt growth, which allows precise control over purity and composition. Purity is extremely critical to the process, so the researchers mix, prepare and vacuum-seal the materials in an industry-standard clean room. They then synthesize the crystal in a furnace above 1100 degree °C and then cool it from the bottom up at a rate of about one millimeter per hour. The researchers then cut the crystal into polished wafers to make the solar cells. "Others have tried dopants, but they didn't have the control and purity that we have. And, the purity matters,'' said Lynn. "WSU is known for growing really high quality and purity crystals. You have to control every step." They start off by saying these cells are cheaper. But then they mention that they used a newer, higher purity method for construction. They discuss efficiency without mentioning any numbers. Then they discuss voltage, but not watts, or efficiency, or watts per centimeter. When are they actually going to discuss the stuff we want to know? "They then synthesize the crystal in a furnace above 1100 degree °C ..."
They could easily expend more energy, during manufacture, than the cells would ever hope to create. To add to your thoughts, guys. Another daily "key improvement in solar cell technology". Except this one has nothing key about it. CdTe is a fun post grad project. I worked on exactly CdTe, a different application a way-way back. Was also good for a publication, no more. Tellurium is about as rare as platinum, so the technology isn't exactly scalable even if it was functionally better than silicon PV. Current world production output of tellurium is only enough for a couple gigawatts worth of CdTe panels. Producing enough to satisfy world demand of PV panels using CdTe would take thousands of years at this rate. Tellurium is a byproduct of copper mining, so it's cheap insofar as the demand doesn't exceed the supply that exists. Once the production of the panels exceeds existing supply from copper mines, extracting tellurium for its own sake becomes extremely expensive. Guys ... ... this is thin-film solar panel! The amount of material used is significantly less than conventional silicon panel, making it "cost efficient" despite expensive material. It has same high grade efficiency, at 20%. As long as you don't mind using 10,000 acres of land for this inefficient technology instead of efficient nuclear, water and fossil fuel. You have to build a city-sized solar farm to power just one city. Rossi's 1 megawatt E-Cat plant, tested for one full year under tightly controlled conditions and 24/7 video security...by a well known third party assessment corporation, that test has come to an end. Rossi's cold fusion device, is showing 20 to 80 COP, in the leaked reports. The official report is due in one month. This makes solar power into drivel, over night. The same for all other efficient alternative energy sources. Destined for the garbage heap, overnight. Ger ready for a battle. Oligarchy, which requires total energy control in order to exist as the parasite it is.... will fight back. Count on it. That is another nonsense! "leaked reports" is not what science community is waiting for. There should be an independent test and that is what Sr. Rossi is carefully avoiding. You'd be surprised. For whatever information is publicly available, you need around 90 tons of tellurium per Gigawatt of CdTe panels, depending on the process and film thickness. Of course this development lowers the amount, but only by 30-40%. The current world production output is around 135 tons a year, almost entirely due to copper mining byproducts, which means the supply cannot increase arbitrarily. If you manufacture more than 1-2 GW of panels per year, you exhaust the current supply and the price of tellurium shoots through the roof. To put that into perspective, the US average electricity demand is on the order of 500 GW, and the capacity factor of a fixed PV panel in the US is between 10-15%. Do the math. You have to build a city-sized solar farm to power just one city. Fortunately the two can coincide vertically. Gosh, Eikka, your calculations do not match up with my experience. I already get more from my solar cells than promised, and that was in February, not June. Our savings on the EV are larger than the savings from the household power. Maybe you should look into the real world, and not just into calculations. The first one of these 'reports' I've read about surfaced in the early 1990's. Guess what. It's (not even) hot air. But if you're so certain then you should invest all your money into Rossi's scam. I'm sure he'll take it with great enthusiasm. Gosh, Eikka, your calculations do not match up with my experience. Your experience is not relevant to real published figures from the field. Of course you can make more energy over some particular month, because the capacity factor of solar panels is in part a matter of weather and cloud cover. You do not own gigawatts of dispersed solar power, so you wouldn't be seeing the average production figures. The point was, that with the currently available supply of tellurium, and the rough ballpark figure of how much you need to make a gigawatt of panels, it would literally take hundreds of years to build enough panels to matter in the scale of an entire nation like the US of A, and much longer still in terms of the entire world. That's why silicon panels are still the champion of solar energy. "Your experience is not relevant to real published figures from the field. " Oh? My real numbers and proven performance are not as important as something you read somewhere else? Is that how you get your "experience"? You are getting to be like Stumpy, who berates folk for saying and doing things he cannot find in Wiki. I suggest you stay in your real field, whatever that is. I am glad you challenged me. My PV panels performed in a month of overcast and cloud cover. I can hardly wait for full Sun and Summer. Your attempts to denigrate alternative energy technologies is transparent. Do you work in a coal plant? Good for people and other living things. My real numbers and proven performance are not as important as something you read somewhere else? Yes. Because your "real numbers" are not representative nor "proven performance", because the true performance of the system is partially down to luck. You're thinking like winning in the slots machines means you have a viable investment strategy. You're just delusional. "will have a top capacity of 6.3 MW, able to generate approximately 5.8 million kWh during the first year of its operation." the capacity factor for a 4.6 MW PV array in Arizona is determined to be 19% over two years. 2) how you locate and orient your panels determines what amount of that radiation they see. This also includes how well your panels work with low-angle off-normal incoming rays. 3) the sort of weather you get over the year determines how close to the optimum as dictated by 1&2 you will actually reach. Basically, if you're in the desert, you get good capacity factor. If you're down near the coast, you get more clouds and lower capacity factor. That's why individual cases like gkam don't tell you anything about solar power in general. Much less so because he's probably lying again, as usual. "I think we have reached some holy grails in batteries – just in the sense of demonstrating that we can create a totally new approach to battery technology, make it work, make it commercially viable, and get it out there to let it do its thing,"
The battery storage systems developed with Arpa-E's support are on the verge of transforming America's electrical grid, a transformation that could unfold within the next five to 10 years, Williams said. Lots of chaff, little wheat. Coulds, woulds, and "I thinks" don't actually do anything. There's no word about what these "holy grail" technology even are, because they don't exist yet. Don't confuse hype and pleas for funding for actual progress. The point is that not everything that is "alternative" actually works, no matter how much YOU want to pretend so in order to pretend that YOU are personally at the forefront of progress and saving the earth. YOUR kind of people are making it worse for everyone because you're a snakeoil salesman, a conman, a crook and a pathological narcistic liar. You work deliberately to cloud other peoples' judgement with propaganda in order to make it seem like your personal choices and exploits are admirable and you deserve credit for things you haven't done and aren't doing. You don't care how much you are hurting other people in your quest for glory, which makes you a hypocrit of the worst kind, and that makes it an imperative to point out your falsehoods so that other people would not fall in the trap. "YOUR kind of people are making it worse for everyone because you're a snakeoil salesman, a conman, a crook and a pathological narcistic liar." Really? Because I actually bought and had installed a solar PV system and an electric vehicle? And you did not? Is that it? You found someone who is not a phony or a Wiki Warrior, and can't take it? you allege " You don't care how much you are hurting other people in your quest for glory, . . "
Yup, that glory I get from Ira and otto and Stumpy, (maybe the same psycho does all three), is all anyone needs. I am not selling anything, Eikka, but you take offense,because my real data points do not support your opinion. Too bad. You really do work in coal, don't you? Because I actually bought and had installed a solar PV system and an electric vehicle? Because we can't trust that you actually did, given the false information you've given in the past, and your habit of embellishing yourself and claiming to be everything you're not, claiming to know things you do not, and offering yourself as an authority and source of information on subjects you have no authority in. You're as real as the reporting on RT. Yes you are. You're selling yourself. I see a minor improvement in voltage, which is nice, but I don't see a cheap scalable fabrication path for this material. Hot oven temperatures, slow crystallization, critical purity requirements - sounds like expensive fab to me.